Here at Trophy Kings we supply all the leading brands in the Trophy world. We work closely together with these brands throughout the season enabling us to give special offers on any promotions they have to you our customers. Trophy Kings can meet all your Team and Club requirements quickly and offering a Professional service. Trophies for all sports and event all available with us here at Trophy Kings such as Football, Rugby, Golf, Cricket ,Darts, Dance and so much more. We offer a 30% or more discount off all Trophies we sell. Our Free Engraving service is in house therefore we can provide a faster turnaround of your order. 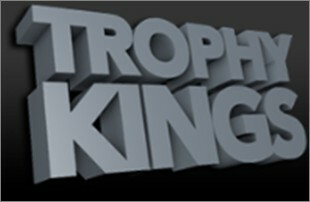 How can you not afford to shop here at Trophy Kings ? We offer a next day delivery on all "in store” items. Our designated staff will be happy to deal with any enquiries you may have. Look out for regular Facebook Offers and Website Deals. Samples supplied on request. We will always go that extra mile here at Trophy Kings to fulfill your Team / Club requirements both efficiently and quickly. DON’T DELAY MAKE THAT TROPHY KINGS CALL TODAY.